And now, a thing I have never seen before. We carried Dragon when it was being published, we’ve handled tons of back issues of the mag…hell, even I bought it for a short time during my brief D&D fling in junior high school. And I’ve seen some pretty early issues of the series cross my path…but never the first issue. Pretty neat, I think. It’s a bit rough, having had an unfortunate random encounter with some moisture (hopefully water) at some point in the past, causing some rippling of the pages, though it remains perfectly readable. It’s a sourcebook for an early role-playing competitor to D&D, and this particular copy’s cover is so beat and rough that it’s actually detached from the pages within. But the book remains readable, with plenty of detailed charts and elaborate descriptions of gameplay. While I’m not a game-player, I do have a peculiar fascination with reading about games, and for reading extensive rules systems like these. In fact, the temptation to hang onto this for a while instead of selling it is pretty strong. Alas, it’s gotta go! The quotes, the covers, the dragon. Fantastic!! Good show Mr. Sterling! How is “permanent coherent voice loss” different than “permanent incoherent voice loss”? If someone tore my tongue out, I’d be pretty damn incoherent. Bit of a Roger Dean influence in The Dragon’s logo. I think about it ALL the time. It’s all I can think about! 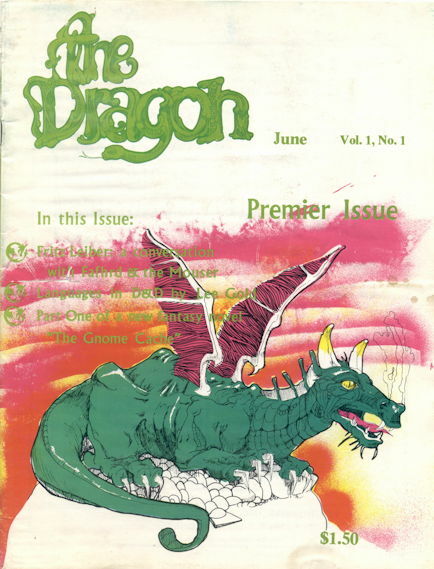 Now the question is, what’s the first issue of Dragon Magazine worth? Is there a huge market for early D&D items? Mike – There used to be a good market for early RPG stuff, but it’s been a while since I’ve delved into that realm…guess I’ll find out soon! The market for old RPG stuff fluctuates wildly at times. Dragon #1, though, has a tendency to hold its value. I like role-playing culture way more than I ever liked role-playing, and the Arduin books are the most fun to read of the early game systems that really weren’t system but homemade spins on D&D. I can connect it to comics, too. One of the players in creator Dave Hargrave’s game was Rory Root. Does Geoff Johns know about this? Another ten years’ worth of comics, easy. My brother subscribed to Dragon for awhile when we were kids, and we got someone’s old castoffs, but the earliest I’ve ever seen is like, #40 or something. So hey, wow, Dragon #1. Are there monsters? Weren’t there like evil kittens in Arduin? Before every issue was put on a CD, I saw 120 $ price tags for THE Dragon #1. Ain’t it the one with the Fritz Leiber piece in it? At that time there was also serious money paid for issue 100, which I guess had a great poster. Some later issues with GIANT posters (they were Size: H) or uncut trading cards are the only ones worth anything now. This post led me down a dark and scary Dragon related internet worm(y)hole. Now I can’t stop thinking about Dave Trampier. 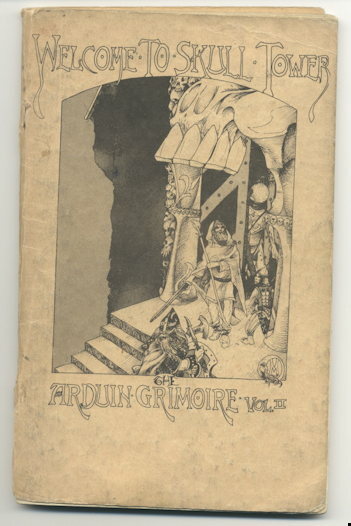 Wow, this takes me back, I remember Dragon #1, and we have copies of Arduin around too, cribbing the occasional bit.